to do business with the entity ? which would be taking any risk, though. Last time we talked about that. The problem was to open offshore bank account with offshore entity when beneficiary was from US. And even when the bank account is opened, someone said that some banks do not want to wire money to forex brokers. If I remember correctly. I believe we stopped at that. I also got the same email, and replied, requesting clarification. I was, however, thinking in another direction. I think FXChoice will continue to be open for anyone that wants to trade through them (Including U. S. based trader, and the EU company will be for EU based traders that want EU regulation. That’s my opinion, for now. We can check with them Sunday night or Monday. Got a message on Linkedin this morning after reaching out to someone at Finpro Trading UK stating that they should be regulated in 2018. Someone by the name of “Kshitij Chopra” stated “regulation is almost at completion state. Will be a reality soon in 2018.” I’ve been interested in Finpro even though they aren’t regulated, but I thought I would post it here since I found them from this thread. FXChoice is continuing business and accepting International clients in the same way as before. Yeah, I have to agree with trusting in Pax Forex as well. Have been with them for some time myself. So far only 2 test withdrawals nothing serious. But they did go through swift & flawlessly. Customer Service seems to bend whenever possible to the satisfaction side even in the greyish areas. Meaning if it doesn’t exactly fit site guidlines but makes common sense they’ll get it done. Just takes a couple lines in an email. They also seek suggestions at every opportunity. This US domiciled resident is quite pleased with Pax. Totally agree with both your observations. BitCoin is maturing and its expensive. In current situation FinPro is still my favourite because I can fund the account with bitcoins while keep my account in USD so I dont have any irsk to BTC price fluctuation. However, the best situation will be to have a broker who can let us deposit via Bitcoins, Etherum, LiteCoin, Ripples among other coins and also allow to change the account denomination into other currencies as and when required. I have been searching around but will not much luck. Will be happy to know if anyone knows any such broker yet. I will share if I find such a combination. 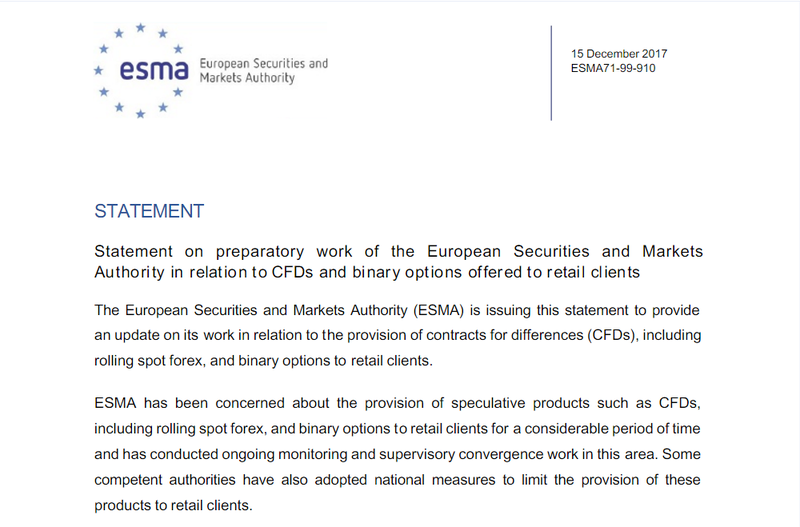 The European Securities and Markets Authority (ESMA) intends to further restrict retail trader access to CFD’s and spot forex, and to ban altogether retail trading of binary options. 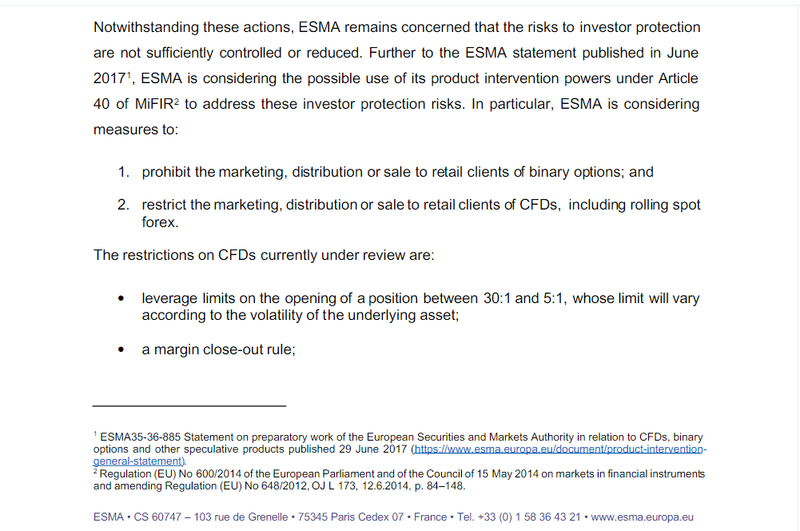 In particular, notice the threatened leverage restrictions in the Statement reproduced below. Soon, retail forex traders in Europe will need a thread like this one to help them make their escape from the Euro Nanny State. Our beloved CFTC has added Capital City Markets to their so-called RED List. The RED List is the CFTC’s list of forex brokers (and some other entities) which are outside the U.S., and beyond the reach of the CFTC, which nevertheless are suspected of doing business with U.S. clients – gasp !! This brings to 4 the number of brokers on our Offshore Broker List that the CFTC has singled out for this special recognition. The other three are Trader’s Way, FX Choice, and Finpro Trading. Our congratulations to Capital City Markets for earning this prestigious award. 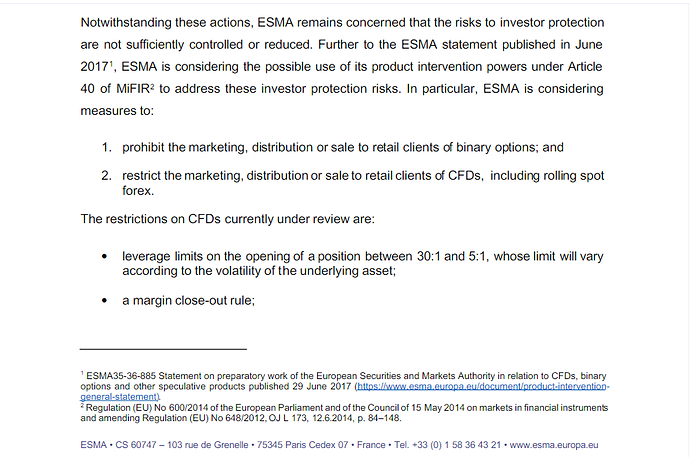 On the press release link for the RED list, I did not see FinProTrading ? R U Sure? Is it under another name? Do you think it’s a “Nanny State” issue @Clint or do you think it’s an attempt to keep us as wage slaves ? After all - if we all became “Traders” - then who is gong to "Work the fifty to get two weeks off ? " This is a very long discussion topic, you have to know if you enter the market is to train as such, not to play! to ditch the retail FX regulatory overreach ?? I can’t make sense of that article, published by Finance Magnates on April Fool’s Day 2016. -- then he's advocating exactly what we've been fighting against for 7 years. Was this whole article supposed to be a joke? If so, it shows the hazards associated with trying to tell jokes in a language that’s not your first language. It’s been a while since I’ve checked in here, but I thought I would post a quick update on LMFX. Up until this point I’ve been happily trading with them. However, due to the super-low commissions at FinPro, I’ve been trying to transfer a large portion of my funds out of LMFX to use at FinPro, which would save me hundreds of dollars per month. Now I’m sitting here 24 days after having my wire transfer request approved by LMFX, and zero funds have arrived at my bank yet. LMFX support remains communicative but ultimately unhelpful. So far I’ve been impressed with LMFX operations, but those good feelings have rapidly deteriorated. If I ever do receive my funds, the prospect of waiting weeks for withdrawals makes me loathe to continue business here. I am also worried about the remainder of my funds at LMFX and if I will ever have a chance to successfully withdraw those. Has anybody currently with LMFX been able to successfully withdraw funds from their account? Methinks I may have wasted your tyme !.. of the current restrictions on U.S. persons ?? My bank recently got back to me literally after 2 whole months an says its been too long and they can not help . I spent hours going through all the info with my bank manager and the fraud department . I went or called weekly until the head of the fraud department told me these things take time and to be patient , I believed those liars until today. I would like to hear if any one has reached out the Payment Provider that CCM says is the thief of all our funds ? I would like to consider also multiple class action law suits and would like to hear back to my personal email to go in depth on how to proceed . By the law we have 1 year to go after our stolen funds , our banks , Visa etc. ------------------------ In new light I also understand that the bank and Visa are charged with the responsibility to keep our funds safe at all times and they have to prove they did , and they did not. • The merchant must be within 100 miles of your home and within your state (this requirement is waived for online purchases).